Last Monday, November 11, Washington, DC’s Saint Sophia Greek Orthodox Cathedral and the Orthodox Fellowship of the Transfiguration (OFT) hosted “On Earth As It Is In Heaven: A Pan-Orthodox Conference On Putting Orthodox Theology and Ecology into Practice”. The first-ever pan-Orthodox conference held in North America on the intersection between Christian ecology, theology, and stewardship of the natural world featured a notable gathering of well-known clergy and lay scholars. Foremost among them were His Eminence Archbishop Demetrios, the Primate of the Greek Orthodox Archdiocese of America, who delivered the opening keynote, and Dr. James Hansen, director emeritus of NASA, who offered the afternoon keynote address. Dr. James Hansen (b. 1941), director emeritus of NASA and Professor in the Department of Earth and Environmental Sciences at Columbia University. Rev. Dr. John Chryssavgis (b. 1958), Archdeacon of the Ecumenical Patriarchate of Constantinople and environmental adviser to H.A.H. Patriarch Bartholomew. 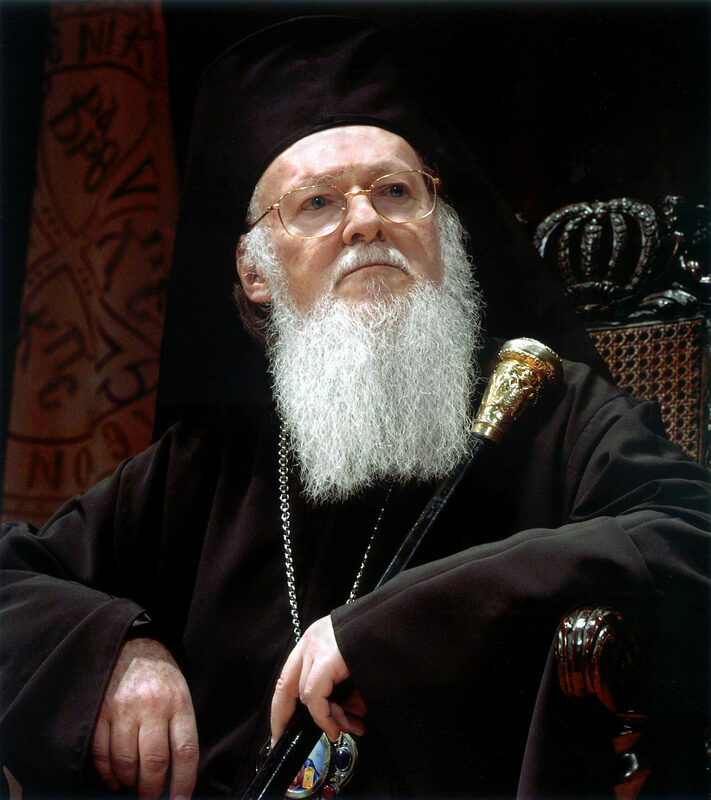 His All Holiness Ecumenical Patriarch Bartholomew, 270th Archbishop of Constantinople and New Rome, successor to St Andrew the First-Called and spiritual leader of the world’s Eastern Orthodox Christians, lauded as the “Green Patriarch” for his love for the natural world and his leadership in promoting sustainability efforts. Photo Courtesy: The Ecumenical Patriarchate. “Orthodox theology, the Scriptures, and the saints all tell us that care for God’s earth is a responsibility for every Christian, yet practice of this aspect of theology has been elusive in many parishes,” said Fred Krueger, executive director of the Orthodox Fellowship of the Transfiguration (OFT), which is co-sponsoring the event, which is designed to help build such practice. Around the world, Orthodox hierarchs are speaking with one voice as they call the Church to engage this issue. Together, they point us to the need for a deeper transfiguring response to the challenge of a world out of harmony with God and His creation. OFT is an affiliate organization of the Assembly of Canonical Orthodox Bishops of North and Central America. Other sponsors include Holy Cross/Hellenic College, St. Vladimir’s Orthodox Seminary, the Orthodox Peace Fellowship, and other Orthodox agencies. I was deeply impressed by the range of Orthodox institutions and jurisdictions present at the conference. From the country’s two leading Orthodox seminaries to the chief umbrella administrative organization for all canonical Orthodox jurisdictions, all Orthodox believers in the United States were represented in the form of conference speakers, organizers or representative attendees. The poster for the conference. Photo courtesy: Orthodox Fellowship of the Transfiguration. Although I was well aware of the Ecumenical Patriarch’s much-lauded title of the “Green Patriarch” (earned by years of consistent activism and leadership on international environmental efforts), I did not expect the welcome attention the speakers paid to the questions of how to practically engage parishioners, local business leaders, and community representatives in grassroots and communal efforts to green parishes without making use of top-down government policies and regulations. The second-to-last afternoon panel, titled “Putting Theology into Action in the Parish” featured OFT Steering Committee member Ms. Anne Glynn Mackoul of Princeton as the moderator. Mr. Athan Manuel used his remarks to equate the fight to preserve and renew the environment with “all other Orthodox moral imperatives”, presumably including the more controversial “social issues” like abortion and homosexuality. Fr. Constantine Lazarakis, pastor of Southampton, NY’s Greek Orthodox Dormition of the Theotokos (Virgin Mary) parish, gave a fascinating lecture on “Designing New Parish Buildings” in which he stressed the pragmatic, cost-effective opportunities offered by construction of a deliberately green church and parish hall for those seeking to maximize the ecological efficacy of their community. Mr. Alex Couloumbis of nearby Bethesda, Maryland’s Greek Orthodox Church of St George provided a thorough overview of how his parish’s Greening Committee prepared an extensive, detailed report on pragmatic opportunities to reduce energy expenses, improve their infrastructure, and make their buildings more energy-efficient using available resources. This Orthodox icon depicts Christ as the Good Shepherd and Steward of All Creation. Photo courtesy: Orthodox Fellowship of the Transfiguration. Following this, Steering Committee member Dr. Alfred K. Siewers, professor of English and Environmental Studies at Bucknell University, moderated a student seminar featuring paper presentations by three seminarians and myself. Ms. Danielle Xanthos, a senior seminarian at Holy Cross Seminary/Hellenic College opened with a fascinating paper on the intersection between Orthodox theology, psychology, and mankind’s relationship with God’s creation. Following Ms. Xanthos’ remarks, St Vladimir’s Seminary seminarian Ms. Martha Carlisle offered an inspiring review of the inaugural year of the seminary’s new St. Herman’s Society for Orthodox Ecology, which she serves as founding president, while Mr. Andrew Stoiko, of St. Tikhon’s Seminary, proposed the parish and campus-level creation of the office of ecological steward. During the course of his remarks, Mr. Stoiko exhorted all present to remember that the laudable emphasis placed on environmental sustainability efforts and fostering greater stewardship of God’s creation must come alongside, and never in place of, equal emphasis on the sacredness of all human life from conception to natural death. Wonderful article, I enjoyed reading your views very much. Please continue your important work. Thank you for your kind words, Jessica! Are you involved in parish or congregational stewardship efforts? An environmental oratorio by composer Robert Kyr, commissioned by Cappella Romana in 2007 and now recorded for the first time, this work explores the urgent issue of ecological crisis caused by humanity s inability to live in harmony with the natural world. A Time for Life draws from texts in Greek Orthodoxy, the Bible, and Native American prayers with an ultimately optimistic approach. The work traces a journey from the glory of Creation through potential modern destruction to a hopeful future, in which humanity serves as a responsible steward of the earth and thus realigns itself with the creative forces of existence, resulting in a spiritual awakening that leads from a state of division and separation to the way of unity and wholeness. Christ is Risen! Thank you very much for your kind reply! I’m so sorry I did not see this until now. Your ensemble at Cappella Romana does truly wonderful work which brings great joy and spiritual edification to so many. Thank you for all that your ensemble does, and, especially, for bringing your recording of Robert Kyr’s A Time for Life to my attention. I look forward with joy to delving further into this. I wish the delegates at last November’s conference at St. Sophia Cathedral could have enjoyed the recording! I am truly encouraged to see our religious leaders embracing creation care and addressing it. Our younger generation is socially conscious and looking for direction, particularly in the way of stewardship of the earth, its resources and creatures. I hope to see our spiritual responsibility towards God’s creatures (animals) addressed at future conferences. Thanks for a great article and I hope to see more progress made by these conferences in the way of animal welfare and resource conservation. Christ is Risen! Thank you very much for your kind feedback. I’m very sorry that I only saw your comments now! I couldn’t agree more with you with regard to the social consciousness of our generation of Orthodox! It was profoundly inspiring for me as a young Orthodox Christian to attend this conference. Fr. John Chryssavgis, one of the main environmental advisers at the Ecumenical Patriarchate, was present, and I had the pleasure of speaking with him at some length. Several of the presenters, echoing His-All Holiness Patriarch Bartholomew, touched on many of the broader spiritual issues relating to creation care, particularly the devastating psychological effects which man’s generally contentious and imbalanced relations with animal creatures have for both man and animals alike. I wish you could have attended the conference! Dear Ryan, I just saw this comment, so we’re way behind in communications! However, I hope you are pursuing your path as I am. It is more important than ever that we include dialogue about humanity’s treatment of the animal kingdom. Especially as it pertains to global warming, increased violence in society, devastation of the earth’s resources from animal agriculture. . .and our human and spiritual responsibility to be good stewards and practice compassion.